Travel etiquette is important every time you leave home and visit a new destination. Even as a tourist, how you act reflects back on you. But as a travel writer it’s even more important. 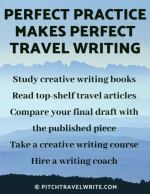 As you produce more and more travel writing bylines in travel magazines and websites, the invitations to press trips will start coming in. 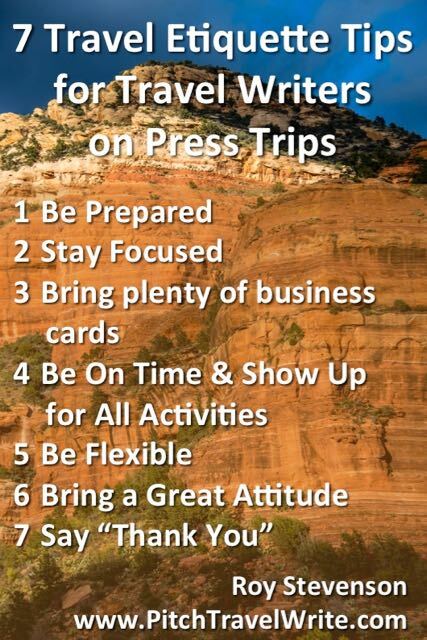 If your travel blog is attracting significant visitors, you may also be invited on press trips. Press Trips and their close cousins, Familiarization Tours (also known as Fam Tours), are where a group of travel journalists visit a region to learn about its attractions. Press Trips are a lot of fun because you get VIP treatment at the destinations and you get to hang out with other travel writers. The cost of these press trips is covered by Destination Marketing Organizations (DMOs), regional CVBs and sometimes PR companies. My travel writing companions and host on Yukon Press Trip. For travel writers and bloggers, a press trip isn’t a free vacation, even though it might feel like one. You’re there as a professional, and you’re at work. Some responsibilities come with attending these tours. The primary expectation is that you will write about the place for print magazines, or travel blogs and websites. Your articles are meant to entice readers to visit the destination by giving them a good impression about what there is to do and see. It’s very much a business “quid pro quo” arrangement. And there’s an unwritten code of travel etiquette that should be followed. When you’re invited on a trip, you need to provide your media contact with as much information as possible about your media outlets so they can customize the trip accordingly. For example, if you sell travel stories in advance of the press trip, you need to be very specific about what places you need to visit. You also need to be specific about how much time you need to spend in each place. I do a lot of press trips to classic car museums around the world. From experience, I know that it takes me about four hours to do everything I need to do. These four hours include a complete the tour of the museum and taking hundreds of photos to accompany my article. I always let my media contact at the DMO know how much time I will need any why I need it. I send my assignment letters to the DMO in advance of the press trip so they know the outlets and requirements. For example, if you underestimate the time you need at the attraction, you will find yourself unable to complete your interviews, photography, tours or whatever else is needed for your assignment. When in doubt, overestimate the time you’ll need. I’ve been on several press trips around Southern Oregon and work with Sue Price, an independent contractor and FAM guide for Southern Oregon Visitor’s Association (SOVA). 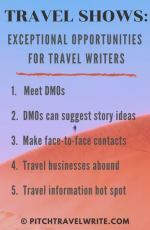 Sue advises that travel writers need to explain what they are looking for so they can be directed to the right people and attractions. She expects travel writers to complete a detailed questionnaire when applying for assistance with the tour. If you are asked to complete a questionnaire in advance, always do it promptly and completely so everyone can be prepared. Your media hosts will send you an itinerary in advance of your trip. Do your homework and review it before you leave home. Sue Price of SOVA recommends that writers and event planners, “Be prepared, take notes, take photos, and show interest. Come prepared with lots of questions. 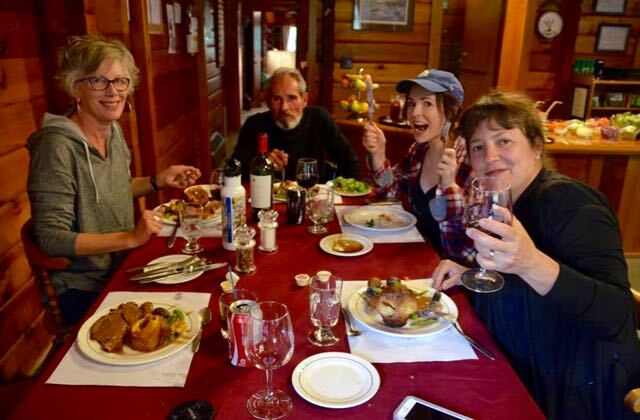 Travel writers (and their hosts) put in long days on press trips. It’s not unusual to start the day and 7 a.m. and finish up at 10 p.m. or later. That’s a long time to stay alert, but it’s your job to do exactly that. Shauna Lunde of Tacoma CVB suggests, “If you have a long day of visits please remember to keep focused and polite even for the last attractions of the day”. You’ll be making a lot of stops each day - in restaurants, tourist attractions, and hotels. Have enough business cards to present to each host along the route. It makes you look professional, and provides some insight to your various hosts about who you are and how they can find you - online or in print. Casey Ressler, from the Mat-Su Convention and Visitors Bureau, Alaska, believes that punctuality is an important etiquette behavior. “Showing up late forces the next places to be rescheduled and FAM organizers hear about it from their members”, she says. Showing up for planned activities is also important. Casey suggests that “If you have received tickets for a play or activity and are not able to make it, please call at least 4 hours prior to the show to cancel, so they can sell the tickets to paying guests”. It’s important to show some flexibility when things go wrong. Good travel etiquette includes being professional and rolling with the punches when this happens. “We may have to change plans altogether on a minute’s notice, due to unforeseen weather, for example”, adds Ressler. If we’re ever put on a ‘holding pattern’ during a press trip, I always use the opportunity to talk shop with my fellow travel writers. I always learn something that will help me sell more stories or explore some new outlets. 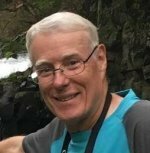 Robin Jacobsen adds, “A thank you email or mailed note upon returning home is always greatly appreciated by those who provided accommodations or were interviewed, or whose places were visited”. I always send thank you emails to my hosts when I arrive home. Along with my thanks, it's another opportunity to remind them about what article I will write for them and the approximate time frame when it will get published. Do people ever behave badly on press trips? Fortunately, the vast majority of travel writers have good travel etiquette and behave professionally. “Although very rare, we have had our share of bad FAM behavior”, says Sue Price of SOVA. It seems that most naughty behaviors stem from writers slipping into a personal vacation mode, forgetting that they are working. Getting into a fight with your spouse while on the press trip. Not tipping at hosted accommodations, restaurants, and services. Asking to leave a planned group activity early, or not showing up at all. Continuously texting or reading your social media instead of paying attention to the tour. Bad mouthing other writers on a tour. Hogging the attention of those being interviewed. Continually wandering away from the group. Looking bored or uninterested; not asking questions. Just remember you’re a guest - not a tourist - and act accordingly. The way you behave - your travel etiquette - is important to your hosts. They do their best to make you happy and show you the best of their region throughout the trip. 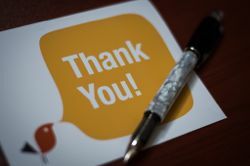 Show your appreciation by being professional and gracious from the beginning of the trip to the end, and you're sure to have a good time. 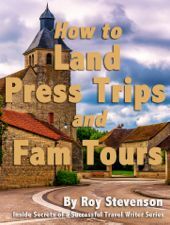 I've written a special report about How to Land Press Trips and Fam Tours. It's explains, in detail, the different kinds of trips that are possible - and all the information you need to get invited on these coveted trips.